L SAHA IS A LUXURY WOMENSWEAR LABEL OFFERING AN ARRAY OF DESIGN LED WARDROBE MUST HAVES THAT ARE DESIGNED AND MADE IN UK USING THE FINEST QUALITY FABRICS WITH SKILLED CRAFTSMANSHIP AND EXCEPTIONAL ATTENTION TO DETAIL. CLEAN CRISP SILHOUETTES, SIMPLICITY AND SOPHISTICATION ARE AT THE CORE OF L SAHA'S DESIGN PHILOSOPHY. HER GRADUATION COLLECTION AT NIFT HAS BEEN AWARDED FOR EXCELLENCE IN USE OF TRADITIONAL TEXTILES IN MODERN CONTEXT. SHE WAS LATER AWARDED THE PRESTIGIOUS RAJBIR SINGH SCHOLARSHIP TO COMPLETE A MA IN FASHION BUSINESS MANAGEMENT AT THE UNIVERSITY OF WESTMINSTER . AS A CHILD LABONI WOULD SPEND HOURS IN HER PLAY ROOM MAKING DRESSES FOR HER BARBIES. HER CURIOSITY LED HER PARENTS TO SEND HER TO A RUSSIAN ART SCHOOL WHERE SHE LEARNT SKETCHING AND PAINTING IN VARIOUS MEDIA. AS A TEENAGER SHE STARTED CREATING HER OWN CLOTHES FROM SCRATCH AND WOULD NEVER MISS A CHANCE TO DRESS IN HER OWN CREATION. AS SHE GREW UP, WITH PROFESSIONAL TRAINING SHE FURTHER POLISHED HER DESIGNING SKILLS AND LEARNT TO GIVE SHAPE TO HER IMAGINATION, IMPECCABLY. LABONI HAS WORKED WITH NAMES LIKE GEORGIA HARDINGE, IZMAYLOVA, GAURAV GUPTA AND LITTLE SHILPA. 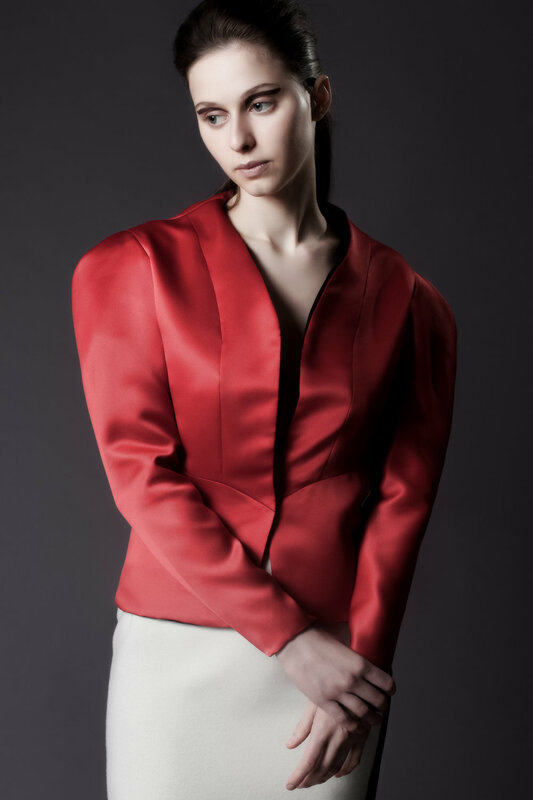 FOLLOWING HER YEARS OF EXPERIENCE IN WOMENSWEAR BUYING WITH RENOWNED ECOMMERCE BUSINESS, IN 2014 SHE DECIDED TO ESTABLISH HER EPONYMOUS LABEL L SAHA.